The Game of Thrones Season 8 premiere delivered a lot of surprises, both on and off the screen. In the latest video of the “Game Revealed” series (via Decider), HBO disclosed that famed director and producer George Lucas visited the set of the mega-popular show in Belfast. Every member of the cast and crew was excited to see the father of the Star Wars saga offering feedback. Co-creator and showrunner David Benioff, perhaps, most of all. Then Lucas offered his input to the scene in which Jon Snow and Daenerys Targaryen talk about Sansa Stark (yes, they allowed Lucas to have input on a love scene again). Eventually, “Winterfell” turned out to be a huge commercial success for HBO, as it broke rating records in several countries. “George would be sitting at my director’s chair; that was so cool for me,” episode director David Nutter revealed. Comedians Martin Starr (Silicon Valley) and Rob McElhenney (It’s Always Sunny in Philadelphia) also made a cameo in the episode, as the “Game Revealed” clip confirmed. 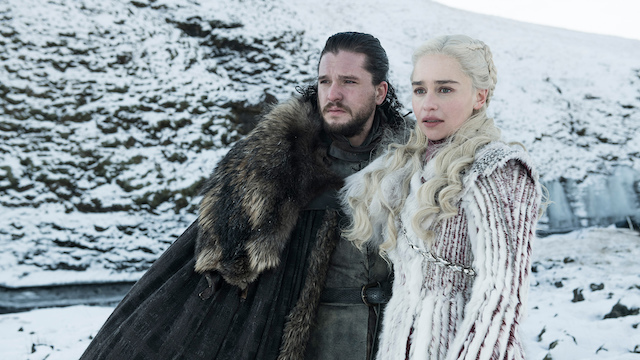 Game of Thrones Season 8 airs Sundays at 9 p.m. EST on HBO. What do you think about George Lucas presence on GoT’s set? Did you like the scene he helped with? Check the Game Revealed video out, then let us know your answers in the comments section below.